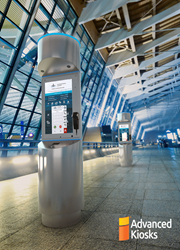 Advanced Kiosks announces the release of the Tower Kiosk, with a built in large vertical touch screen this computer kiosk is designed for high volume use in public spaces such as airports and is ideal for servicing the travel and transportation industry. At over 7 feet tall, this sleek and versatile self serve kiosk stands head and shoulders above the rest with a rugged and beautiful steel enclosure trimmed with customizable LED lighting for high visibility. This Tower Kiosk is also designed to emit safety warnings to passengers within the airport using flashing LED lights and a customizable alarm. Optional add-on features include a VOIP handset with a retracting cord, credit card reader, bar code scanner, durable metal keyboard, touch pad and more. Currently, airports are at the top of the list for the longest check in lines and information booth bottlenecks when compared to other heavily populated industries. Technology is being integrated throughout airports to assist with the problem of the increasing number of travelers and the decreased airport staffing. According to the TSA (from CNN Travel), “For fiscal year 2016, the TSA's authorized staffing level is 42,525 and passenger volume is projected to be 740 million.There's been a 15 percent increase in passenger volume and a 10 percent drop in staffing since fiscal year 2013”. Self service technology and the use of computer kiosks is growing at an accelerated pace. Businesses and facilities in many industries are recognizing the need and benefits to be gained with increased efficiency, lower demand on human resources and satisfying customers by putting quick access to solutions in their reach, 24 hours a day. Directors and managers have more innovative choices now to accommodate growth and higher demands with computer kiosks and self serve technology. The Tower Kiosk is one of 15 different high quality computer kiosk models engineered by Advanced Kiosks. This kiosk includes a 32” vertical multi touch screen, a steel enclosure height of 88.5”, Intel 2.6 GHz quad core processor, 2GB DDR3 memory, 60GB solid state drive, wi-fi with high gain antenna, and stereo speakers. It can withstand temperatures from 32° F to 104° F and is designed with commercial grade components for heavy usage. The computer OS is Windows 10 Professional, making it compatible with most third party software. As with all computer kiosks from Advanced Kiosks, the Tower Kiosk is designed to integrate and display most web based software or third party applications. Additionally, an assortment of standard software comes pre-installed on each kiosk which allows the user to control and administrate a single computer kiosk or multiple locations remotely! Lock down and control the user experience as needed in just minutes with the easy to use, intuitive Zamok software suite. Advanced Kiosks is an innovator and leader in engineering both hardware, software and security for computer kiosks, serving dozens of industries. This allows them to excel and sets them apart in almost every capacity including quality, service, support, product development and integration capabilities. All products are designed, engineered and built in the USA using the best, commercial grade components. Each kiosk comes with a three year warranty, and includes a full suite of computer kiosk management software, and technical support. Contact a technical sales representative today for more information about the Tower Kiosk or guidance for the best self serve options for your business or organization. Please call (603) 865-1000, or email sales(at)advancedkiosks.com.